We are the manufacturers of Commercial Reverse Osmosis System. NISHU ENTERPRISEoffers complete Range of Commercial Reverse Osmosis Units Premium Series for Water and Waste Water Treatment Plants having a very Large Range and capacitities. Aguapuro offers the State-of-the-Art Packaged Reverse Osmosis Systems complete with Pre & Post Treatment equipments offering Very Pure Water from Brackish water. Water Produced using Reverse Osmosis Technology is of very Low TDS & free from Particulate, Organic and Colloidal matter. These Systems comprise of Raw Water Feed Pump, Multi Media Filter Unit, Activated Carbon Filter Unit, Anti Scalent Dosing Unit, (Optional-Water Softener) Micron Bag and/or Cartridge Filter and Reverse Osmosis Unit with Optional UV Sterilizer unit at the outlet of RO unit. These systems are used for water having TDS up to 2000 ppm. 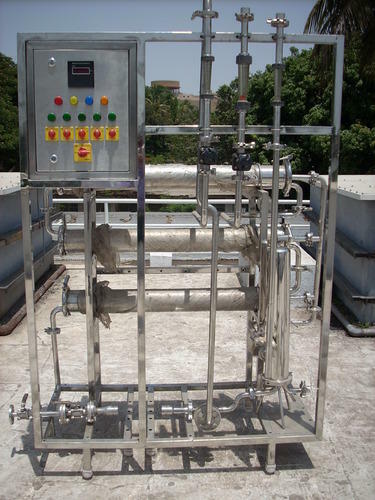 Systems for Higher TDS are custom Designed and offer for the same can be procured from NISHU ENTERPRISE Sales division. NISHU ENTERPRISE offers these capacities in this series, ranging from 100 LPH to 2 M3/hr and more.